I had an "aha!" moment recently watching one of my favorite movies, "The Big Chill," for the umpteenth time. I have loved this movie ever since it came out in 1983...for a lot of reasons. It captures much of the nostalgia we feel for our college days. It also captures many "for real" dynamics that happen when old friends get together who haven't seen each other in a while. Old tensions and attractions heat up. People argue and make up. They cling to each other as security against the big bad world, in which they are "alone." And they also show an innocence lost. They will never be the same in their 30's as they were in their 20's, although much of the movie is about recapturing this lost idealism. Highlights of the movie are the great kitchen clean-up/dance scene, choreographed to "Ain't Too Proud to Beg" and the very intricate dialogue that really rings true, holds up to the test of time even 25 years later, and makes it a writer's movie. Low moments, if there are any, are the 80's self-absorption a la 30 Something (which was apparently semi inspired by this movie) which is part of the emotional territory of the time. From wikipedia: "Thirtysomething was influenced by the 1983 film, The Big Chill. It reflected the angst felt by baby boomers and yuppies in the United States during the 1980s, such as the changing expectations related to masculinity and femininity introduced during the era of second-wave feminism. There is also the strong presence of the video camera in the movie, almost as a character in itself. Characters use the camera to explore various aspects of their lives and states of beings, and to reminisce about the recent suicide of their college friend Alex, and are "exposed" in a way that they really aren't when they are face to face with one another. Interestingly, this is also used as a plot device, as the film shows the characters watching themselves and reacting - a movie within a movie, so to speak. Early precursor to social networking? The characters and writers all get big points for eloquence. Most of us don't want to see people complain, but it becomes much more palatable when done with wit and style as this cast does. Aside from Woody Allen's Annie Hall (1975), in which Alvy Singer speaks directly into the camera as if it were a character, I think this is the first movie I have seen that uses the video camera as both a character and plot device. 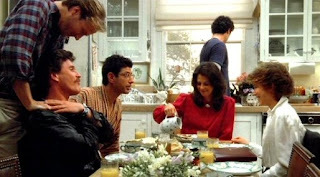 Ironically, if "The Big Chill" were made today, the characters could all stay connected on Facebook, send each other YouTube links, and Twitter about their lives several times a day. But then the 60's would really seem far away. This is an interview with Lawrence Kasdan and the cast about the making of the movie. "The Big Chill Reunion Part 1."